There's not been an awful lot of activity on the NEAG blog of late so just to prove we're still about .........today we enjoyed a presentation by Dave Jones of DJModels. This proved to be a very interesting and entertaining afternoon. By prior arrangement we were joined by members of the North East and Borders Area Group of the EM Gauge Society courtesy of Keith Smart. Well, there's a little bit of cross pollination here because being a member of the EM Gauge Society myself I have one foot in that camp too...! 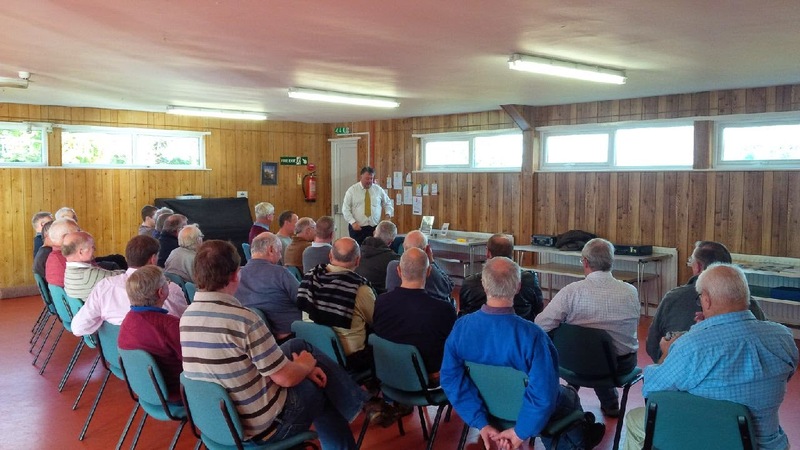 There were 30 of us in total who heard Dave describe his overall philosophy in relation to production of models, principally locomotives, in 'N' 'OO' and 'O' gauges. It goes without saying we all enjoyed the afternoon very much indeed and eagerly await the first offerings which will be the result of Dave's labours. He obviously knows a bit about the environment in which model manufacturers find themselves. Above is a picture taken during the course of Dave's presentation. Not many of our speaker's continue after tea, but Dave did and that, I think, shows the interest that exists within not only our group but also those who work in a different scale.